I had another question, but creating this one separately so it doesn't get lost. The upload button on one of my forms isn't working and users can't upload documents and images. Also, on this same form, when we embed it in our website, it appears that the conditions are not working. I have many conditions built in, however it is still showing all fields regardless of the conditions. My other forms seem to be working fine. Hello Prudence. 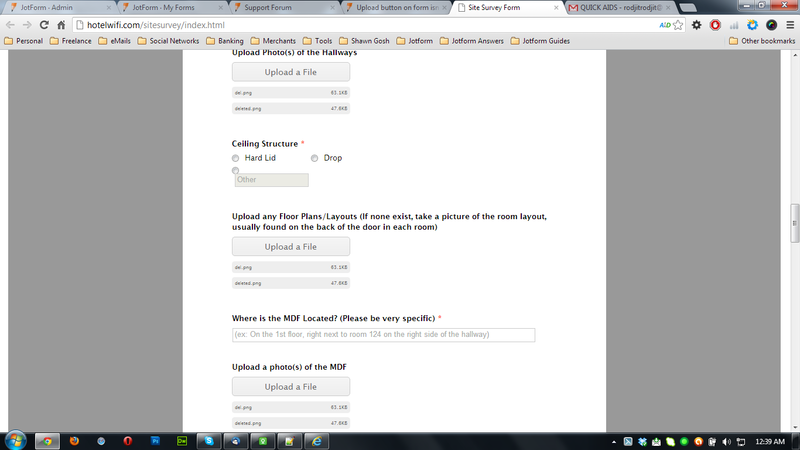 Can you please provide us a URL of the web page where your form is embedded? It works sometimes for some people and not for others. Are there issues that are browser specific maybe? Thanks for providing link, I have asked you here on this thread for URL and provide some solutions. There maybe a conflict with your site JS codes and Jotform codes so I would suggest to please embed your codes using iframe format. Hope this solution will solved your problem and please let us know if the problem still occur so we can check it further.